Impextraco® products maintain birds’ intestinal integrity, preserving their productivity and ensuring animal welfare. The Xtra-performance® anticoccidial quality, allied to the correct use, provides the competitiveness required by the current poultry production market. Considering that coccidiosis is a constant challenge to the poultry industry, the lack of an effective control measure compromises its profitability, as well as the animal health. No matter what type of anticoccidial programme is used, there is an alternation needed between different kinds of products. In a shuttle and rotation programme both ionophores and chemical anticoccidials are indispensable for an appropriate application. The Ionophore Anticoccidials act against the coccidia during their life cycle in the lumen. Additionally, they have antibiotic action, mainly against Gram positive bacteria, such as Clostridium perfringens. These characteristics enable an effective action against the parasites, decreasing their absolute number inside the birds. These products are produced by chemical synthesis. Synthetic drugs have a specific mode of action against parasite metabolism. Some are used in cleaning programmes because they reduce rapidly and substantially the oocyst number in the environment. The association of chemical and ionophore anticoccidial provide the positive characteristics of both categories. Ingredients are combined creating products in order to fill gaps in the coccidiosis prevention programmes, according to the birds’ life period or parasite life cycle. MNGrow® is the association of the chemical active ingredient nicarbazin and the ionophore, maduramycin. It was developed as the appropriated product to be used after Lerbek® and Robimpex® cleaning programmes. Coccidiosis is a poultry disease caused by a protozoan parasite of the Eimeria genus. Their presence in nature is almost unavoidable, as parts of the life cycle is in the form of an incapsulated oocyst outside the bird. This oocyst is impervious to most chemical substances. 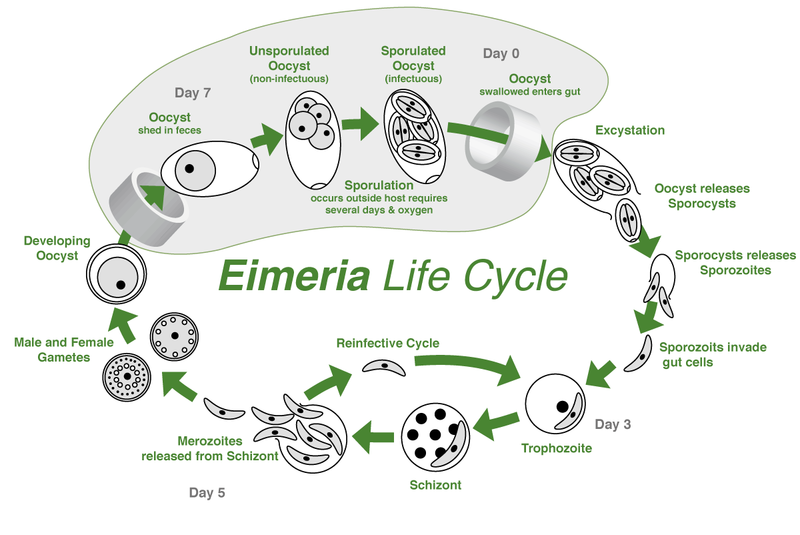 Eimeria multiply in the intestinal cells causing, among other disorders, enteriditis and diarrhea. Wet litter, oxygen and warm temperatures create the ideal environment to induce sporulation outside the bird, leading to the formation of sporulated oocysts which are the infective form of the parasite. After the ingestion of sporulated oocysts the coccidial life cycle starts inside the bird, causing subclinical coccidiosis or coccidiosis as such. Subclinical coccidiosis is the most occurring form, characterized by mild intestinal lesions and disturbance of normal mucous production by the intestinal cells. In consequence performance parameters are reduced due to the outcome of diarrhea, anaemia, bone development problems and reduced digestion. The main financial losses are caused by the subclinical form of the disease. Due to the less noticeable symptoms, medication is rarely used, leading to poor performance. Coccidiosis not only reduces nutrient absorption, it can also induce and act synergistically with other enteric diseases increasing possible intestinal harm and affecting performance. As today’s market is very competitive, optimizing gut health and intestinal integrity are extremely important and often makes the difference between loss and benefit. However, we only have a few effective products or limited number of ingredients that can resolve this never ending battle against coccidiosis. The improved genetical potential of the birds is forcing us to maximize our effort to control coccidiosis in promoting birds optimal growth and minimal feed conversion. Coccidiosis management is crucial. There are few anticoccidial components known and in the near future there are few new components to be expected. This makes it tremendously important to use all the current products as optimal as possible to challenge actual and future resistance. Download the brochure Download our brochure.